We invite you to explore India - the Land with infinite beauty ! Whether you soar high into Himalayas or peer under the ruins of the Ancient monuments dotting the landscape of India, you will cherish the experience long after your visit ! This India Travel Guide on Pahalgam Kashmir is free from any commercial interest! This site is dedicated to promote India - the vast subcontinent, its glorious past, magnificent landscape and its infinite variety. At an altitude of 2,740m Pahalgam is a premier hill station in Kashmir. The far stretching green meadows, the cascading Lidder River, picturesque snow-capped mountains, plants blossoming with assortment of colors - every part of Pahalgam abounds in splendid natural beauty. Like any other hill station, the weather in Pahalgam is cool year-round. Even during summer the maximum temperature does not exceed 25 degree Celsius. To experience the mesmerizing beauty during the cold climate, plan your visit between November and January. Being there during the rainy months, July and September offers an altogether diverse experience. To indulge in fun-filled snow sports and for a snowfall experience, the appropriate months would be December to February. After flying into Srinagar, if you are eager to capture the inherent beauty in its entirety, opt for the road trip from Srinagar to Pahalgam. The drive itself is very alluring. The many deep turns and valleys that are part of the 95 kms, 2 ½ hour road travel unfold varied scenic beauty. As the destination nears, one can also sense the gradual dip in temperature and the freshness of air building up - Pahalgam's gentle way of beckoning tourists. Soon, the Lidder River can be sighted. Pahalgam spreads along the banks of the Lidder, running right through the town. Along the way, the gentle stream gradually increases to a turbulent flow with abundant foam flecked on the swinging waves. As the wonderful sceneries continue to unfurl along the way, you are in proximity to experience the unparalleled magical charm of Pahalgam. Finding accommodation that offer panoramic view of the splendor of Pahalgam allows you to enjoy your stay. Most hotels and resorts are strategically built to allow tourists to bask in the beauty of Pahalgam. The view of pines, river Lidder, the surrounding landscapes, peaks covered with layers of snow extend serenity and tranquility. Sight-seeing around Pahalgam and fun activities primarily attract tourists. The magical combination of pleasant weather, tourist spots, hiking, trekking, golfing, the culture and friendly locals makes Pahalgam a remarkable holiday destination at all times during the year. Going around Pahalgam is done mostly by walk, taxi and pony rides. Choosing to walk is a good idea provided you are part of an equally enthusiastic group. For many tourists who prefer to walk, the Kahwa, the rich, aromatic specially brewed Kashmiri tea serves as a perfect relaxant. Lidder River: The Lidder River and Lidder valley is a major tourist attraction in Pahalgam. The snow-fed river originates from the glaciers in the high mountains in Pahalgam. Many streams enrich the river. The lush green grass allures people to relax and unwind. Enthusiastic rafters enjoy Whitewater rafting in the river. Stretches of Lidder River are suitable for trout fishing. The season begins from April and continues till September. The river has plenty of brown and rainbow trout. Fishing equipment can be hired but license has to be obtained for fishing. Either contact your tour service provider or approach the Directorate of Fisheries in Srinagar. Spend some time to gain information as to where to head to find the best fishing beats. Mamaleshwar Temple: On the opposite bank of Lidder River is a temple dedicated to Lord Shiva. Dating back to the 12th century temple, the limestone construction of Mamaleshwar temple is regarded as the oldest temple in the Kashmir Valley. The ancient architecture attracts tourists to this old temple. Kolahoi Glacier: Though Pahalgam offers many treks like the Aru Valley, Tarsar Lake, Chandiwari and Leh, Kolahoi Glacier is chosen by most adventurous and spirited. Imagine looking at a glacier at close quarters! Close to Lidder River is the Kolahoi glacier. Currently, a 5 km long hanging glacier, trekking to the base of Kolahoi Glacier promises adventure-filled lasting memories. The trek commences from Aru, a small village 15 kms from Pahalgam. A minimum of four days is required for the trek. The base camps make the night stay comfortable and thoroughly recharge the trekkers for the next day. Look for a trekking package that doesn't follow a hurried schedule but allows for considerable time to appreciate the beauty that lies en route. There is so much to enjoy. Trekkers get to traverse through beautiful pine forest, walk on snow covered slopes, see freezing water flowing at great speed and capture the rays of sun slowly melt the snow. Enjoying a snow ride, the sight of dogs chasing wild foxes back into the forest area, looking at close quarters a mountain completely washed away by a recent avalanche only adds to the excitement. Baisaran: This is a beautiful meadow surrounded by thick forest, located just 5 km from the main city. Three hour trekking is an option as it is a short trek through the woods. The other option is pony rides. Driving can get bothersome as the terrain is rocky. Having reached Baisaran, get your binoculars out to appreciate the beauty that lies ahead. Capture panoramic field views as well as the view of Lidder Valley. Little wonder that it is called Mini Switzerland. Tulian or Tulyan Lake: This lake is located between two Himalayan mountain ranges, Pir Panjal and Zanskar. At an altitude of 3353m, Tulian Lake is 11 kilometers from Baisaran and 16 kms from Pahalgam. Trekking or driving through the forest road takes you to Tulian Lake. In the absence of established trek routes and considering the heights, trekking for a day can prove to be exhausting and tiresome. Other than the summer months, it is usual to see chunks of ice floating in the lake and the mountains on the sides covered by snow. Find her a picture perfect place with the pine trees closely dotting the landscape. Step into the boathouse, seize your camera and capture the beauty all around. 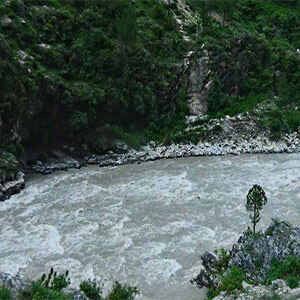 Chandanwadi: Around 16 kms from Pahalgam, at an elevation of 2923 m above sea level is Chandanwadi, the starting point of the Amarnath Cave Pilgrimage which is held every year to pay homage to the ice linga of Lord Shiva. The attraction of this place is its snow covered mountains and breathtaking scenic beauty, the snow covered bridge and the nearby icy glaciers. Driving from Pahalgam by car or traveling by mini buses takes tourists to Chandanwadi. Sheshnag Lake: The Lake lies in the track leading to Amarnath Yatra. Though far-off from Pahalgam, about 31 kilometers northeast is Sheshnag Lake. Tourists can travel upto Chandanwadi and then walk up to Sheshnag. The walk can prove to be tiresome but all the strain vanishes after sighting the snow clad mountains all around and the view of the snow peaks which seem to float in the lake water. The high altitude mountain lake is favored by trekkers, especially when the lake is frozen between December and March. 'Frozen lake treading' extends the ultimate adrenalin rush. This is a major attraction for the most adventurous souls. The lake is in liquid state during the other months. Trekking to high altitude mountains require a certain level of fitness, Sheshnag Lake fits into this category as the Lake is located at an elevation of 12,000 feet above sea level. Betaab valley: Originally, referred to as Hajan valley, post filming of Hindi blockbuster film Betaab, the valley was renamed Betaab. The valley is located northeast of Pahalgam and falls between Pahalgam and Chandanwadi and is en route Amarnath Yatra. It is a hotspot for trekkers as the place serves as a base for trekking and further exploration of the mountains. Squat on the grasslands; cast your eyes up to capture the surroundings, snow-tipped mountains skirted with tall conifers. The sound of rushing river, the gentle cool breeze makes the place irresistible. This is a great spot for a picnic, fishing in the many trout-fishing avenues and horse riding. Pahalgam golf course: The best golf course in India is equally renowned for its scintillating surroundings. The 18 holes golf course is surrounded by towering mountains lined with alpine forests. An absolute golfer's delight, this could be a lifetime opportunity to play golf at an altitude of 2400 meters above sea level. The changes in elevation, water in play on 6 holes, the bunkers of all sizes and shapes make golf playing really challenging. If you are ready to test your skills, book a golf cart in advance. Originally a shepherd's village, Pahalgam is famous for woolen products. Shawls, carpets, clothing with unique embroidery are most sought after. Kashmiri handicraft items like jewelry boxes, mirror frames, intricately carved furniture, silk and wool carpets in Persian designs are some items tourists look to purchase from Pahalgam. Namdas, a kind of mattress and gabbas, embroidered rugs are in great demand which can be purchased from any of the local shops.